Filigree decoration is something which has been around since 3000 BC. 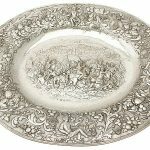 There has been such amazing and beautiful metalwork made using this technique, and as fans of AC Silver will know we love our antiquities and beautiful metalwork. Filigree is very popular throughout the world but is particularly seen in Indian and Asian metalwork. But where did this technique come from and where did filigree first start? Filigree is a type of decoration made of metal work, usually from gold or silver. Small beads and twists of threaded metal are woven together or used separately to create intricate motif patterns. How the pattern is formed whether that is swirls, twists, leaves or flowers is influenced by where it is made. 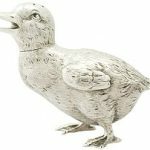 The design can be built up using metal and then soldered together to make a piece, or placed on the surface of an object to add decoration. When completed it often looks takes a lace like form which is truly stunning. 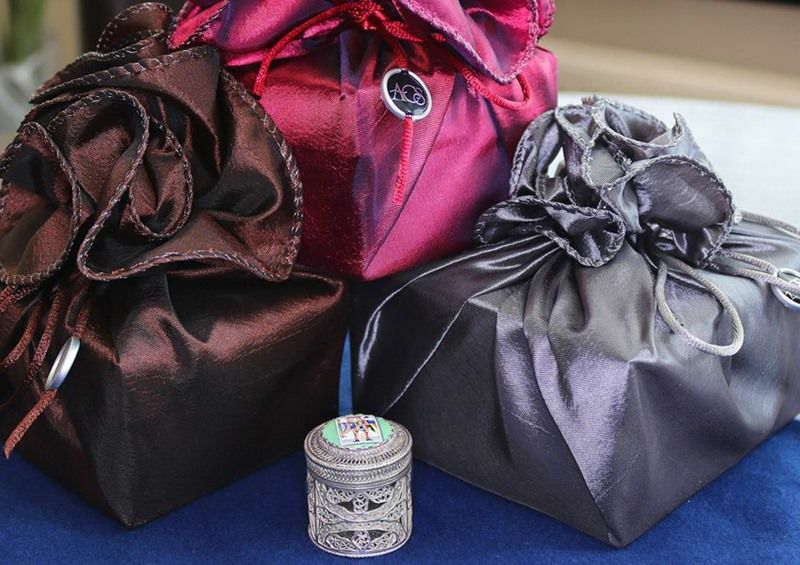 Filigree boxes can come in all shapes and sizes, from very small to very large and usually made out of gold or silver. Some are lined and some have glass, enamel or gemstone tops; it really all depends on the purpose of the box. For example jewellery boxes, pill boxes and vinaigrette cases have been made in this form. As can be explained from the history section, these types of boxes can come from all around the world. It’s a little less about the box itself but rather the amazing world that comes from the filigree decoration. 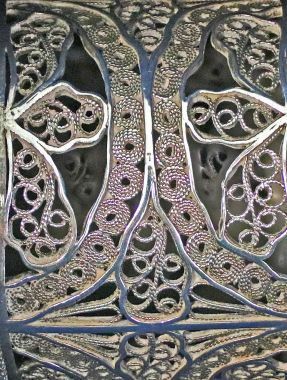 Filigree is the shortened version of the word Filigreen which comes from the Latin word ‘filum’ meaning thread and ‘granum’ meaning small bead. Filigree is also known as ‘telkari’ meaning wirework which is taken from the Anatolian word. This was developed in the 15th Century in the city of Midyat to which craftsmen still specialise in today. From Archaeological finds jewellery has been found dating back to 3000BC with this type of decoration. But during the period of 6th to 3rd centuries BC filigree is said to have reached its highest level of precision. In medieval times filigree work was used to embellish crosses and covers of bibles which usually had precious stones set into the metal. As already mentioned India has a filigree history along with Central Asia; this is said to have migrated east from the Greeks and so they both have similar styles that can be seen in jewelry today. Filigree also became very popular in the 1660’s in French jewelry. The Irish are also known for this type of metalwork. However, it is slightly different as the wire appears and disappears without continuity to which they are famous for. As you may have grasped from the history there are many places throughout the world that have used this technique to produce some magnificent pieces. Some pieces from ancient times have been uncovered and can be seen in the Louvre and the British Museum. The Museum of the Hermitage also holds a large collection of Ukraine jewellery found in tombs in Crimean Peninsula. In ancient times the skill of filigree is something that every jeweler had to have where nowadays it is deemed specialized to only some. 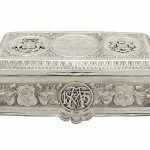 We are very lucky at AC Silver to have a rare and stunning silver Filigree Counter box in our inventory. As you can see from the pictures the box has fine and impressive spiraling scroll filigree decoration arranged into geometric floral designs. It has a cylindrical form with the base encompassed with an applied band embellished with woven texture. 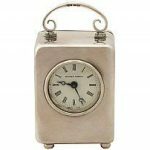 This silver filigree box is fitted with a push fit cover encircled with a rope twist decorated border. The upper surface of the cover is embellished with a band reflecting the design to the sides, in addition to a central triangular claw set enamel panel depicting a ‘King of Clubs’ playing card design on a green background. The enamel is in exceptional condition with high colour quality. There are no hallmarks as to be expected with such a piece; the date and origin can be determined by the composition and decoration. These type of boxes can be very hard to find in such excellent condition. All the decoration is very crisp and sharp. This box would have been used to store gaming counters while playing cards. These type of boxes are generally found in the mid to latter part of the 18th century depicts when gambling was a common pastime. This very beautiful circa 1820’s silver Filigree Counter Box is certainly an excellent example of its kind. 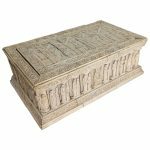 This exceptional box would make a fine addition to any collector or collection. As already noted the Filigree box can come in all shapes and sizes, with precious stones in set or enamel placed in it. Some have a particular use; for example a jewelry box, trinket box or they can be just for decoration. 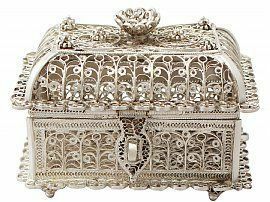 But as we have ascertained filigree is more about the intricate design that these boxes are made up of rather than their use. Not only does the art of filigree have such a long history which has lasted through to the current day, it is also truly a thing of beauty and an amazing skill. We hope you love filigree as much as we do, until next time! Next Entry: What is Silver Gilt?